Throughout cultures and traditions, human’s struggle for existence has been described as a battle against not only the powers in nature but also the dark side residing in his own self. As being shaped with and around cultures and periods, these hero motifs in this eternal war have fronted us with forms carrying humanbeing’s universal concerns and aims. The term “Chaoskampf”, based on religious and mythological texts, relates with the idea of a monster of chaos ruining the existing order in structure, constantly being opposed by these heroes. This traditional and monstrous motif destroying order has generally been visualized as a huge snake or a dragon. Buğdanoğlu’s recent works are shaped with a pictorial setting focusing on the Chaos and the ones standing against it. Reflecting on new perspectives and produced by renewed techniques, these art works reveal the artist’s experimental seeking. As it becomes possible to see the clash of chaos and order on the surface in his paintings through intertwining tones of color, his drawings and prints contain more of figurative impressions about this opposition. Berkay Buğdanoğlu has received his BA degree from Maryland Institute College of Art with David Jacobs and C. V. Starr scholarships. Between 2007 – 2011, he traveled in and around the USA and Eastern Europe as making freelance animation and illustration. 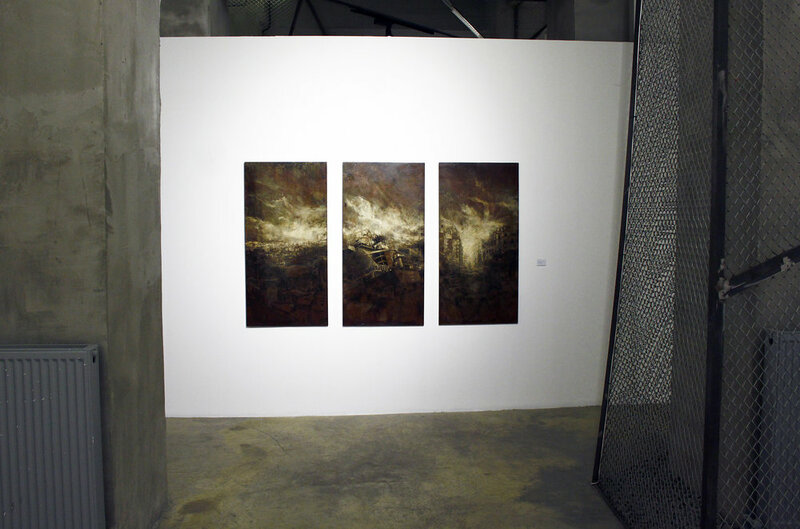 He opened his first solo show “01; Ante Bellum” in May 2012 at Mim Art & Antiques. His second solo show “Grigori” was at Mixer in 2013. In 2014, he realized “MHIE” project with Murat Durusoy at C.A.M. Gallery.